The decision by WFC to lengthen its sheet over the last few quarters, albeit while remaining asset-sensitive, looks prescient given that, in Q3, long rates reversed and gave up the increase of Q2. As a result, on Wednesday, we expect WFC to report a gain on its available-for-sale securities portfolio (flowing through other comprehensive income or OCI, not earnings) of $1.5bn or more. Given the equity-build needed to support the balance-sheet is unlikely to meaningfully exceed $2bn, this OCI gain makes it difficult for management to avoid breaching the upper-end of its guidance range for the net payout ratio of 55-75% (see Chart below). Specifically, we expect WFC to report a Q3 net payout ratio of ~80% representing a net return of capital of ~$5bn and a net reduction in the stock count of ~50mm. These results assume some deleveraging (with our model lifting the tangible-equity-to-assets-ratio by 10bps sequentially to 8.25%). divided by the net income applicable to common stock. In practice, and despite increasing RWA-intensity as growth in loans exceeds growth in the non-loan assets, WFC does not need to de-lever given both that the fully-phased in CET1 ratio stands at 10.6% (under both standard and advanced approaches) versus the regulatory minimum of 8.0% and that the firm has substantial excess capital under stress on both risk-based and leverage bases. The justification for adjusting leverage is that it provides a buffer to absorb OCI losses when rates do back-up and so tends to smooth the payout ratio over time. Given the sector-wide potential for capital return we are overweight the large-cap banks in general with a preference for C and BAC. It is difficult to see how WFC will keep its net payout ratio below the top-end of the guidance range of 55-75% when it reports on Wednesday. Treasury yields (10-year CMT) fell from 2.43% at end-June to 2.05% at end-September reversing the back-up in rates in Q2 and suggesting OCI gains of $1.5bn or more or nearly as much as our estimate of the $2bn equity-build needed to support the balance sheet (assuming some deleveraging). Specifically, added to consensus estimates for stockholders’ net income of $5.8bn, the OCI gain generates comprehensive income of $7.3bn netting down to $5bn after dividends. With deposit growth slowing, the WFC balance sheet will likely be sequentially flat at $1.72tn and, even allowing for a 10bps increase in the tangible-equity-to-assets ratio to 8.25%, will not require an equity-build of more than $2bn. 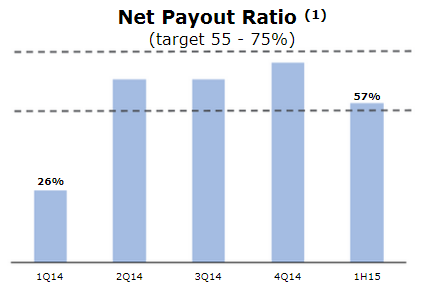 This leaves $3bn available for net buyback generating, along with the common dividend at 34% earnings, an aggregate net payout ratio of over 80% (and 50mm net reduction in the stock count – see Exhibit 2). We have not included in the analysis ~$870mm raised through a preferred issue on September 15th even though this was likely not used to redeem other preferred stock. Of course, if rates back-up in the fourth quarter, OCI losses will constrain the net payout possibly to below the lower-end of the guidance-range as modeled above; this provides a justification for the deleveraging assumed this quarter which, in effect, acts as a buffer so that swings in rates are absorbed partially through the balance sheet rather than entirely in the payout ratio. Another justification is the reported purchase of a $30bn specialty finance portfolio from GE (in addition to the $9bn of overseas commercial real-estate loans announced in April). 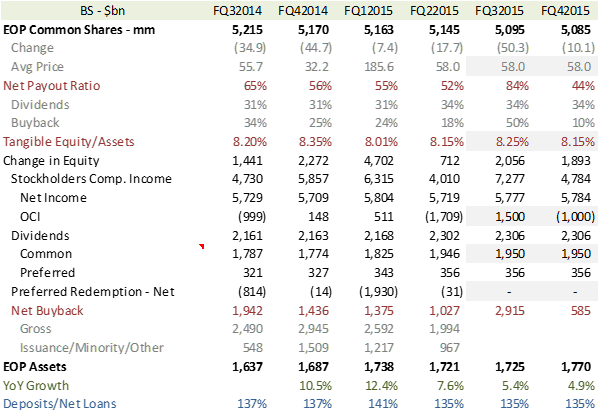 Along with more general loan growth, this will tend to increase the RWA-intensity of the balance sheet. 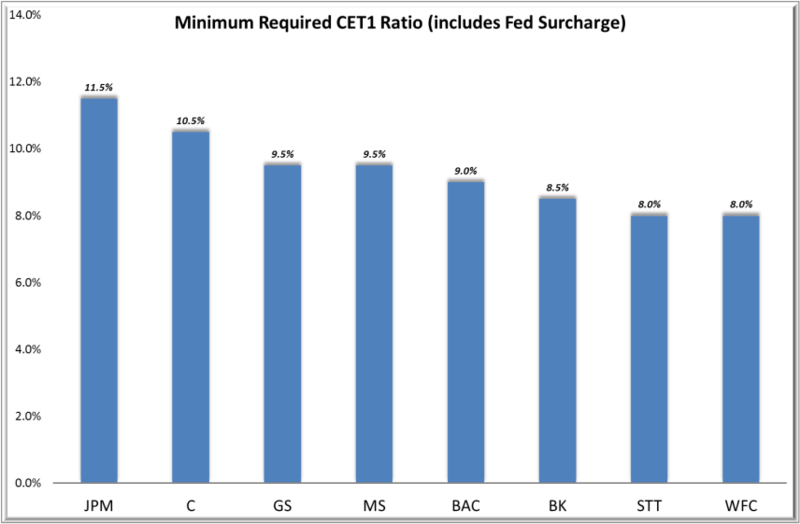 In practice, WFC does not need additional capital given the fully-phased in CET1 ratio stands at 10.6% (under both standard and advanced approaches) versus the regulatory minimum of 8.0% (see Exhibit 3) and, under the stress-tests, has substantial excess capital on both risk-based and leverage bases (see Exhibit 4). ©2015, SSR LLC, 1055 Washington Blvd, Stamford, CT 06901. All rights reserved. The information contained in this report has been obtained from sources believed to be reliable, and its accuracy and completeness is not guaranteed. No representation or warranty, express or implied, is made as to the fairness, accuracy, completeness or correctness of the information and opinions contained herein. The views and other information provided are subject to change without notice. This report is issued without regard to the specific investment objectives, financial situation or particular needs of any specific recipient and is not construed as a solicitation or an offer to buy or sell any securities or related financial instruments. Past performance is not necessarily a guide to future results. The analyst principally responsible for the preparation of this research or a member of the analyst’s household holds a long equity position in the following stocks: JPM, C, BAC, WFC, and GS.